PPF are proud to announce plans to offer there complete underpinning package direct to mainstream insurance companies. These insurance companies will benefit from our professional and dedicated approach to a difficult area of construction work. We are currently looking to increase our on-site and office based staff to cater for the rise in subsidence claims in the South East due to changing weather conditions. 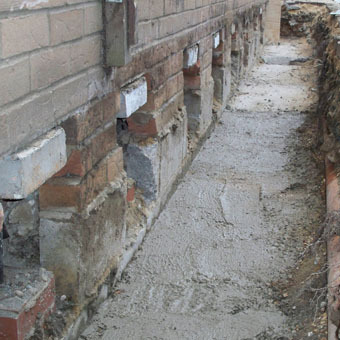 Underpinning has been a recognised solution to combat subsidence for many years but we are constantly striving to improve our service and in doing so focus on three main areas. To minimise the disruption suffered by the home owner/claimant. When PPF are appointed at the start of the project we can work closely with the structural engineer at the design stage and carry out an intensive site survey. This will ensure any potential construction issues are flagged up early and necessary design changes can be made prior to starting work on site, therefore reducing the risk of any costly hold ups when work begins. Competitive cost. We are currently extending our off-site storage facility which will enable us to stock large quantities of the materials frequently required for all underpinning projects. Our new storage area will not only help us to supply materials on demand but with the advantage of buying materials in bulk will reduce our overall contract cost. Also, by operating our own fleet of piling and underpinning equipment PPF can control project costs. Our in house buying department is always striving to secure the most competitive rates for all outside material supplies, whilst keeping a keen eye on any new approved products that enter the market. By taking care when carrying out enabling works our building contractors will identify any internal and external fixtures, fitting and surfaces that can be removed, stored and reused if required when reinstating the building and its landscape. All of which ensure our costs are competitive. To maximise customer satisfaction. PPF do not pretend to be building contractors. Our expertise lies in constructing suitable underpin foundations. We leave the finishing touch to our handpicked expert building contractors. In many cases using the same team of operatives that carried out the enabling works to complete the reinstatement work and bring the building and surroundings back to their former glory. PPF take pride in handing over a completed underpinning contract on time, on budget and to the client’s complete satisfaction.